Pea soup for the soul…why not? This delectable dish embodies the simple vitalities of life – health, warmth, and alluring deliciousness. With its eclectic mixture of colorful vegetables, wholesome meats, and of course, fresh peas, split pea soup seduces the senses, and makes anyone within reach eager for a taste. November 10-17, celebrate National Split Pea Soup Week by enjoying this hearty meal with its inviting aroma and welcoming warmth. One of the very first instant products was a pea soup product, invented by Johann Heinrich Grüneberg in Germany. Greek and Roman vendors used to sell it in the streets of Athens. There is speculation that pea soup was served in Denmark as early as the Bronze Age, when dried peas and cabbage became popular for the long winters there. Split pea soup is subtly different when its recipe is authentic to a specific region and culture. Host a party where everyone brings a different pea soup dish that pairs with a particular country and enjoy a collection of distinct tastes from around the world. Sure there are many people who claim to cook, but how many can say, “I’m an expert”? Become a master of this specific cooking division, and wow your friends and family with your savvy. Due to pea soup’s diverse background, it offers a genuine opportunity for exploration and creativity. Throw caution to the wind, and experiment with new recipe ideas. Infinite possibilities await, and who knows what you could discover? Split Pea Soup is mentioned in the play The Birds by Aristophanes, an Athenian playwright. Koek en zopie outlets (small food and drinks stalls), were installed during winters along frozen canals, ponds and lakes in the Netherlands to cater to ice skaters, serving pea soup as a savory snack. Swedish king Eric XIV (1533-1577) is said to have died after eating arsenic-poisoned pea soup…but don’t worry, he didn’t have a lot of friends. Split pea soup is comfort food at its best. Enjoy this savory dish on a cold winter night, sitting by a fire with family and friends, and let your worries drift away. 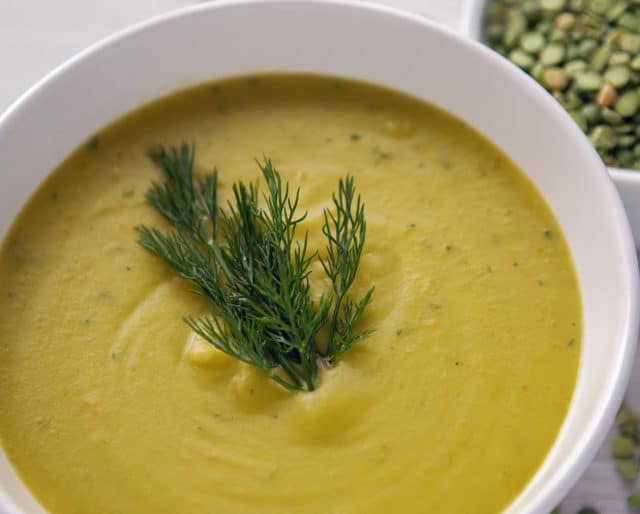 Split pea soup provides essential nutrients and vitamins essential to a healthy body. It is especially rich in dietary fiber, potassium, and Vitamin K, which is a key component to help the body recover from injury. You don’t have to be a master chef to prepare split pea soup, but you can certainly explore more complex recipes if you wish. Split pea soup, at its most basic level, is quite simple. That said, if you feel adventurous, there are endless nuances and twists you can add to your dish to make it unique for your lucky guests.